The forehand tennis volley is easy to break down. One of the keys to hitting a crisp volley is to hit the ball well in front of your body. 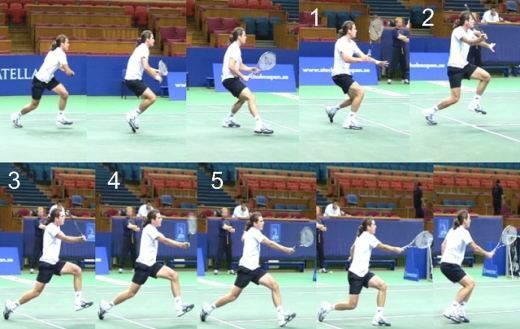 Please refer to Tommy Hass’s forehand volley illustration as you go through the two steps. Form the ready position transfer weight to the outside foot (right foot if you are right handed). As you transfer your weight turn your shoulders sideways. Your hitting hand should not go behind your hitting arm shoulder. The racket head should go back beyond your hitting arm. Your hitting arm and racket forms a ‘U’ almost parallel to the net. Step into the court with your inside foot (left foot if you are right handed) and transfer your weight to the inside foot. As you transfer your weight swing forward with your racket and arm to the contact point which will be in front of your body. It is important to swing your racket and hitting arm together as a unit and not separately. When you swing the racket it should have a forward and downwards movement. You should not just chip the ball. After contact there is a very short follow through of the racket.